"I just watched Supernatural 'cause I loves me some Judeo-Christian mythology," declares Justine. "It is heretical to mythologize any currently relevant theology," admonishes her priestly companion (who happens to be a reptilian humanoid). "Besides, such stories are satanic." "By the same token, any narrative involving angels fighting demons is also angelic," she replies, "just like any telling of the Titanomachy is both Olympic and Titanic." If you don't know the terms, look 'em up! In the middle of the cold Atlantic Ocean in 1912, Justine comments, "Wrong Titanic." If she were transported to the modern international games, that would be the wrong Olympic, too. "Seriously, people." 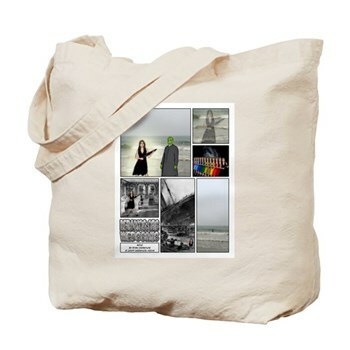 How about this tote bag? For groceries, maybe? Comments are closed, but you can reach the author on Twitter: @DeRamosMedia (please follow!). Please note: Comments are open only for seven days after publication of each blog entry. To Posterity -- and Beyond! Do It Yourself For Fucks Sake! Welcome to "My Bad Date Stories"! Vronz auf Radio Orange und Updates! Whitny's "Not Oprah's Book Club"